Be it schedule rating, experience rating or retrospective rating; actuaries use data to build complex algorithms to determine premiums and offer customers the best deals available. However, tools that can keep up with an evolving market and dynamic pace are, unfortunately quite limited. Car insurance premiums, for example, need to factor in tons of variables. Your driving record, how much you use your car, where it’s parked, your age, gender, the car’s model, your credit score, or type and amount of coverage (and several more) are all considered for customer specific premium rates. Since finding data from tables and then punching everything on a calculator won’t make sense today, actuaries use different methods. Today, most insurance companies still use Microsoft Excel for calculating rates, and for a good reason. Excel has one of the simplest UIs a software can possibly have and yet, offers thousands of features that perfectly complement calculations, while at the same time, serving as a database. Having a very easy learning curve, almost every business professional knows how to work with Excel. SpreadsheetWEB can turn Excel based rating tools into mobile applications, effectively creating a mobile platform that uses the latest data and calculation logic. All calculations and interface created in Excel is transferred as is; no versioning issues, no recoding the logic. 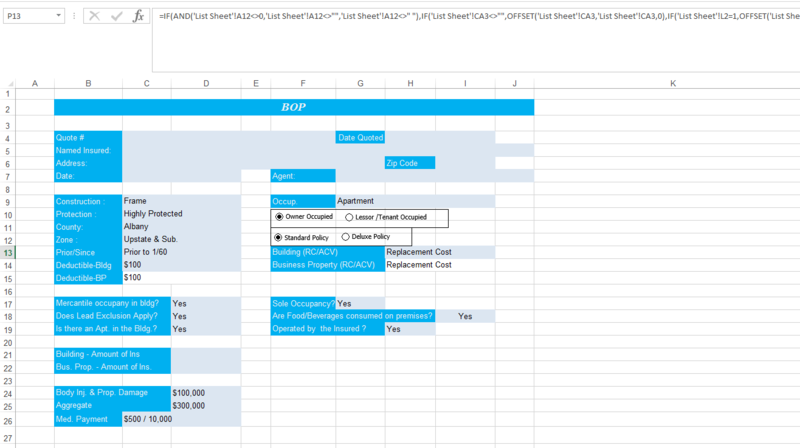 SpreadsheetWEB basically helps preserve all the hard work put into Excel spreadsheets and convey them as they are to the end user, while all data is residing safely on your server. Let’s take an example. 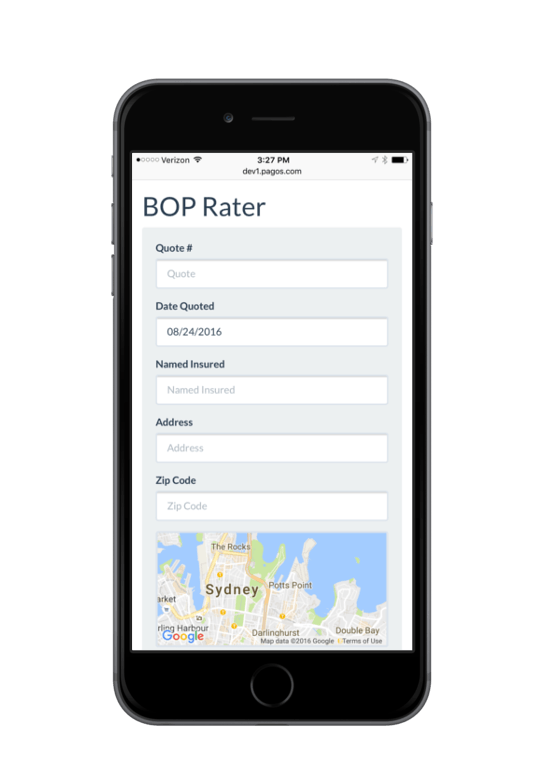 Here is a business owner’s policy (BOP) calculator, which combines major property and liability insurance risks in one package. These policies consider several parameters and give a few premium options to the client. This workbook has calculations, underlying data and reporting template on different sheets (or outside the visible area). The underwriter enters the inputs and then receives the premium payment and deductible amounts on a printable page. 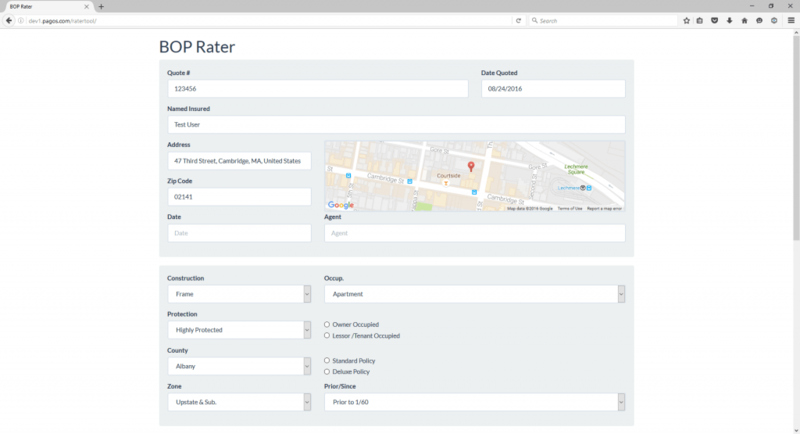 The customer can see what rates are offered in no time. Converting a calculator like this one into a web application takes only a few minutes with SpreadsheetWEB. Adding a few UI elements, that application can then be transformed into a mobile page. A mobile enabled page will scale every element depending on the device accessing it, and pages will have a crisp look both on desktop and mobile browsers. Notice how the page structure changes for two platforms, and provides better accessibility. Having converted into a web page, these applications can also be combined with other web based tools such as maps; or API connections for integration with other services. Microsoft Excel is still the preferred choice of many insurance companies mainly because it can provide tons of functionalities without any compromise on ease of use. SpreadsheetWEB can utilize the hours of work put into actuary calculations and spreadsheet templates created and make these tools accessible everywhere; even on mobile devices. This way, hardware limitations can be overcome and security no longer becomes an issue since everything is on the server side.